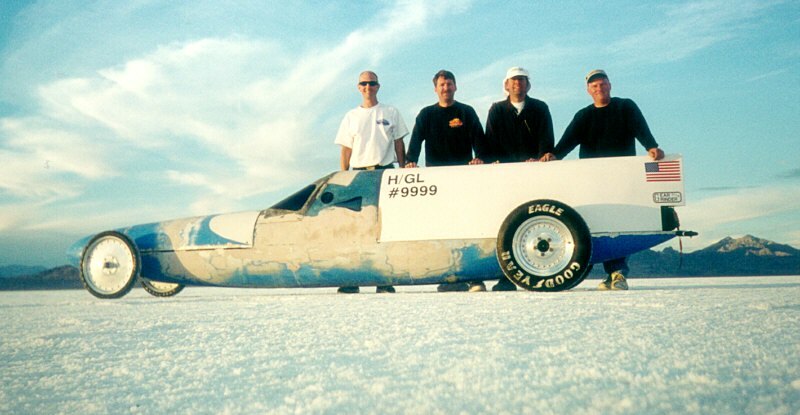 10-23-01 At Bonneville Salt Flats! 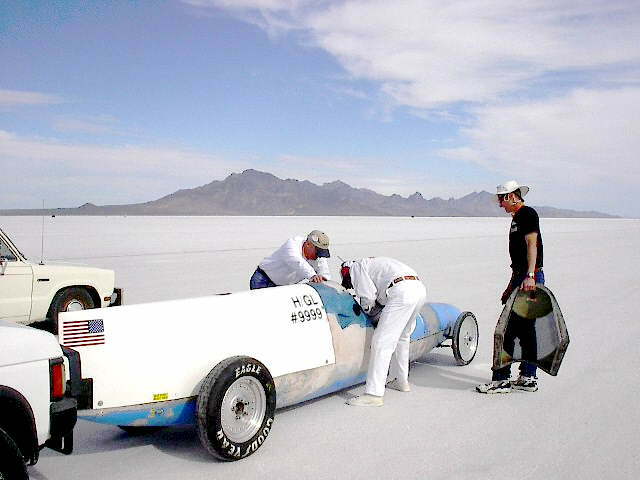 We're back from Bonneville! It was one of the fastest weeks of my life, no pun intended. James, Mark & I along with Bob Visser drove up Monday from Southern California to Wendover, Utah. Tuesday, we drove out to the salt and set up the timing equipment and our pits. This was Bob's first trip to the salt and as a special treat, we let him make a bunch of passes though the timing traps in my SUV to make sure everything was working correctly. He discovered that my Nissan would only do about 96 MPH. This was enough to get high speed for the day. Tuesday night, my parents arrived in Wendover for the races. They seemed to enjoy the whole affair, even though I've never thought of them as "Motor-heads" Wednesday morning, we started racing. James was working the timing stand with the SCTA/BNI officials while Mark, Bob & I headed for the starting line with the car. On that first day, I (Alan) was doing all of the driving. We had installed a gear ratio that would be necessary if we wanted to be close to the record in our class. Unfortunately, we only went 157.7 Mph. Oh well, there was lots of tuning to do on the motor. We had installed a Data Logger to record what the engine was doing during the run and "Power Commander" to control the timing of the fuel injection and ignition. While set up the laptop computer to pull the data, Mark & Bob worked on the engine. On the second run, I went 167.7Mph. During the run however, there seamed to something wrong with the chain drive. Mark asked if it started while in first gear,second or what. I replied that I couldn't remember when it started, but that it had been there during second gear. We got back to the pits and discovered that the mounting for the rear axal sub-frame had bent. When I pulled the data from the on-board computer, it showed that the damage had occurred when I shifted from first to second. We learned that we had to be gentle during the shifts to prevent this type of damage. This is only one example of the useful stuff that a data logger can provide while letting the driver concentrate on driving. It took the rest of the day to fix the damage. We borrowed a cutting torch and some 1/4" plate from the Vesco Team (more on them later). The next day it was Mark's turn to drive. With more tuning on the motor, he managed to go 169.290 on his second run. Back in the pits we discovered that a fuel fitting had cracked. 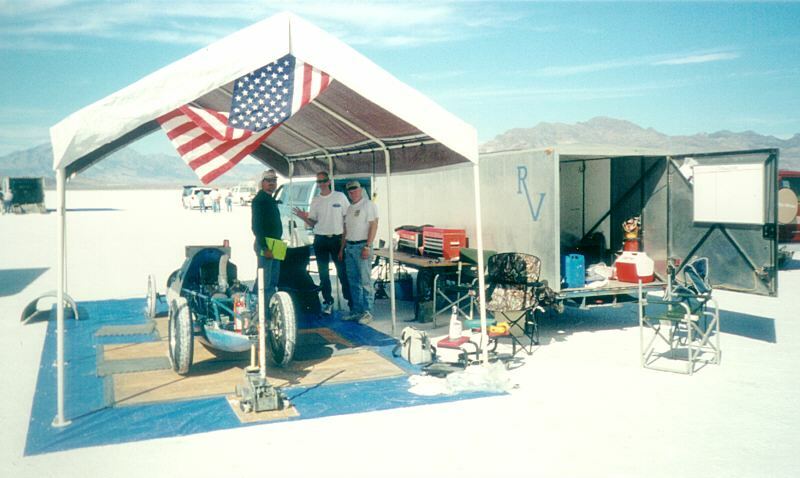 We pulled the fuel pump and fixed the fitting and raced to get the car assembled in time to make a third run that day. We beet the deadline but at the starting line the motor refused to start. We pushed the car back to the pits and discovered that the fuel pump pressure regulator had a bad "O"ring. Friday, It was James' day to drive, but he said we could keep driving until we had worked out the bugs. At the BNI events there are two types of cars: "Short Course" and "Long Course". Short course cars are only allowed to drive under power to the 3 mile marker. To become a long course car you must drive 175 mph or faster between the 2 mile and 2.25 mile sensors. Once you have done this, you can drive under power for the full 5 miles. On our first pass on Friday I went 173.35 in the "quarter" (2 to 2.25 miles) and 175.74 in the "mile" (actually between miles 2 and 3). Not quite good enough. More tuning in the pits and we let James have a run at it while I worked in the timing stand. After an issue with the parachute was resolved, James went 176.00 in the "quarter" and 178.59 in the mile... We were a now a "Long Course" car! James after qualifying us for the "Long Course". After more tuning Mark made a pass with a best mile speed of 184.45 in the third mile (between miles 4 and 5) with an unofficial exit speed of 186.26 (measured over the last 132 feet of the five mile long track) We did some more tuning and I took a turn on the long course but we had finally reached the limit of our tuning and I only went 182. Every morning James & I have to start up the timing computer and test the track. We let my dad drive the track in his Suburu wagon which surprised us all with a 104 mph pass. We decided to only do one run on Saturday since the class record was safely out of our reach and we didn't want to hurt the car before the end of the local El Mirage racing season. We made one more gear change and re tuned it to Friday's best settings. James made his run on the long course and turned a team best mile average 184.90. We packed up the pits and James & Mark headed back towards Southern California while Bob & I stayed to pack up the timing gear. Bob & I headed back Sunday morning. We all managed to drive 3 miles in under one minute and get our "B" competition licenses. We learned a lot of things about our new motor. 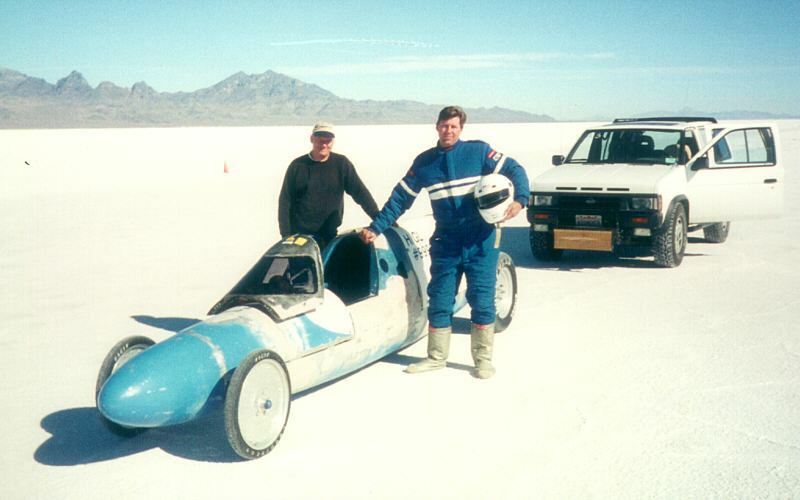 And for the first time returned from Bonneville with a working automobile. While were there we watched (and officially timed) the Vesco Turbinator set a new World's Record for the fastest automobile (wheel driven) at 458 Mph. Quite a lot for only one week.